This course will provide you the skills and knowledge of working at a height and understanding the fundamentals of fall arrest and fall restraint in either a construction or mining environment. Under the legislation the height safety courses are competency based. This course will provide you the basics for your career to work and to install a method to prevent a fall..
For people conducting refresher courses (every 2 years) this maybe about learning something new and remembering previous skills for future reference on the work site. For both levels of experience, we blend theory applications with practical exercises to form competency. All RII competency based courses are designed to allow all levels of experience in one course. RPL and credit transfer: Due to work sites requiring this unit to be conducted every 2 years. We are unable to offer RPL or credit transfers on this course. 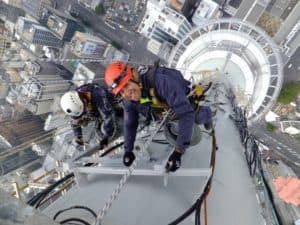 Access and install equipment | static lines | knots | correctly fitting harness and specific safety gear | Static lines | demonstrating hazard identification and implementation of controls | Perform work at heights / field exercises. N/A for this course due to industry requirements. A new 1 day course is always conducted. Group discount of more than 4 people available for this course . Please contact us with your inquiry for a quote, thank you.